Backyard Kill - Coopers Hawk? 3:00 pm January 6 Southeast Oakville, Ontario backyard. We watched a bird of prey consume a Mourning Dove. 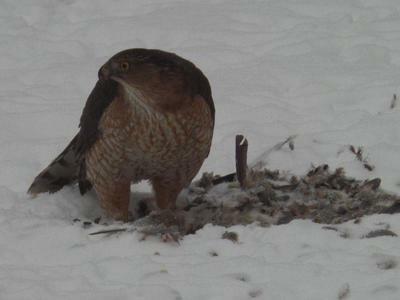 The kill took place at our backyard bird-feeder, and the bird of prey was kind enough to consume the whole thing, allowing me to take many photos. We are not sure what the bird it, maybe a hawk of some kind. Thank you so much Monica, your pictures are wonderful! 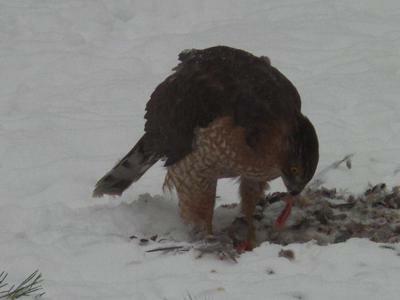 I'm sure one of our readers will know what kind of hawk this is and I will also post this on our facebook page. Cooper's Hawk .... saw one in our front yard tree (London, Ontario) last year with a tiny bird in its talons. The bird Monica Dingle was asking about, is the Cooper's Hawk. one of the founders of what was at that time, called the Museum of Natural History, in New York. 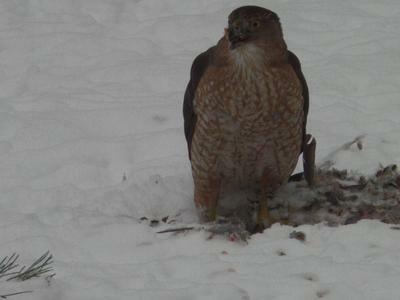 Great photos, that is a Cooper's Hawk.